On Saturday, I was feeling a bit under the weather so I cancelled my plans and stayed at home in an attempt to beat the oncoming cold. Not having gone outside all day, I was faced with the challenge of finding something to photograph in the house. Note that this is my temporary home so many of my more cherished and interesting possessions are not with me. Monkeys were my favorite animal before I switched to being a big turtle fan in my early teens. This particular pouch (that’s what it is, it actually holds things) was availble in turtle form as well. 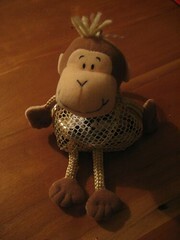 However, I decided to get one of those for my brother while getting a monkey version for myself. I use it to hold batteries and assorted small gadgety things when I travel. This entry was posted on Tuesday, October 31st, 2006 at 9:42 am	and is filed under Project 365. You can follow any responses to this entry through the RSS 2.0 feed. Both comments and pings are currently closed. Cute! Funny, I’m a turtle fan too.